April 16, 2019 -- Researchers from Israel have created a 3D-printed model that captures the immunological, biochemical, cellular, and anatomical properties of a real human heart, according to an article published online April 15 in Advanced Science. The group, led by Tal Dvir, PhD, of Tel Aviv University, developed a new technique for engineering patient-specific heart tissue using a tissue biopsy taken from a patient's omentum. They divided this tissue sample into separate parts for growth into two cell types, cardiomyocytes and endothelial cells, and then combined these cells with hydrogels. 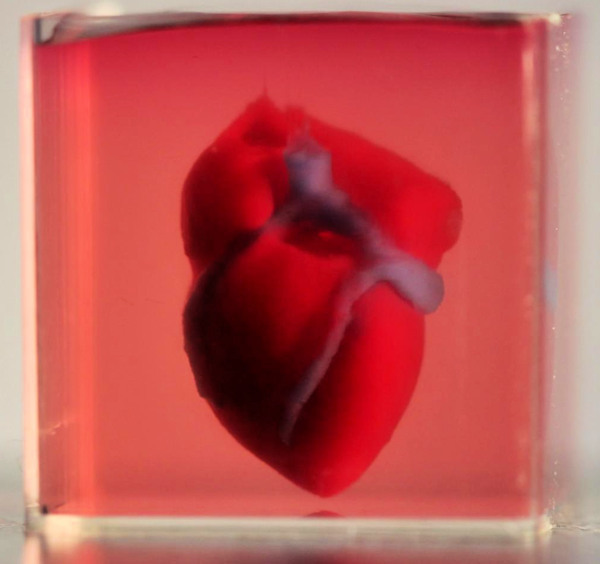 The resulting mixtures served as bioink materials for 3D printing cardiac tissue and blood vessels. After preparing the bioink, Dvir and colleagues produced a 3D virtual heart model based on data from a patient's CT scans. They used computer-aided design (CAD) software to add tiny blood vessels, not captured on conventional CT scans, to the 3D models to ensure adequate oxygen exposure to the heart. Realistic 3D-printed heart using bioink. Image courtesy of Noor et al. CC BY 3.0. Using the 3D virtual models as a template, the researchers 3D printed the fundamental structure of a heart with their bioink, which grew into a realistic miniature heart model following an incubation protocol. "This is the first time anyone anywhere has successfully engineered and printed an entire heart replete with cells, blood vessels, ventricles, and chambers," Dvir said in a statement. "People have managed to 3D print the structure of a heart in the past, but not with cells or with blood vessels. Our results demonstrate the potential of our approach for engineering personalized tissue and organ replacement in the future."